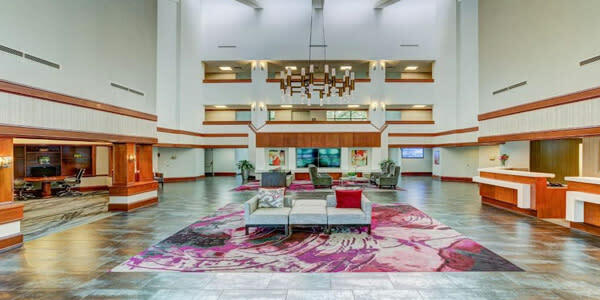 Our hotel properties provide warm accommodations, personalized service, conference and event spaces and competitive rates. Among Dublin’s hotels, the accommodating and full service properties all offer around 13,000 square feet of meeting and exhibit space. 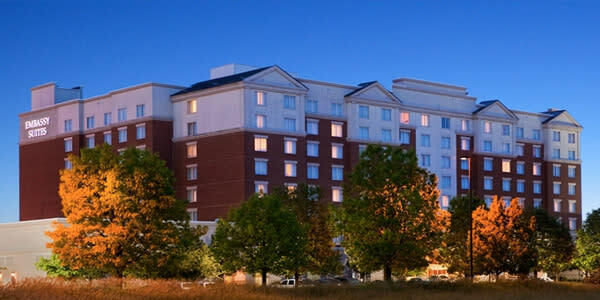 Crowne Plaza is a full service hotel with recently renovated hotel rooms. The Grand Dublin Ballroom is 6,000 square feet and can accommodate 780 guests. The Ballroom Foyer is a multi-use space that works well for vendors or networking. The other Irish-inspired meeting rooms: Shamrock Suite, Limerick, Wexford, Kildare, Waterford Ballroom, Belfast and Cork Boardroom can accommodate anywhere from 24 to 200 attendees. The Kelly Glen outdoor private courtyard can be used for gatherings or break-out space for guests to relax. Meeting Space: 13,000 sq. ft.
Embassy Suites Dublin is a full service, all-suite hotel that just completed full renovations of the common areas and rooms. 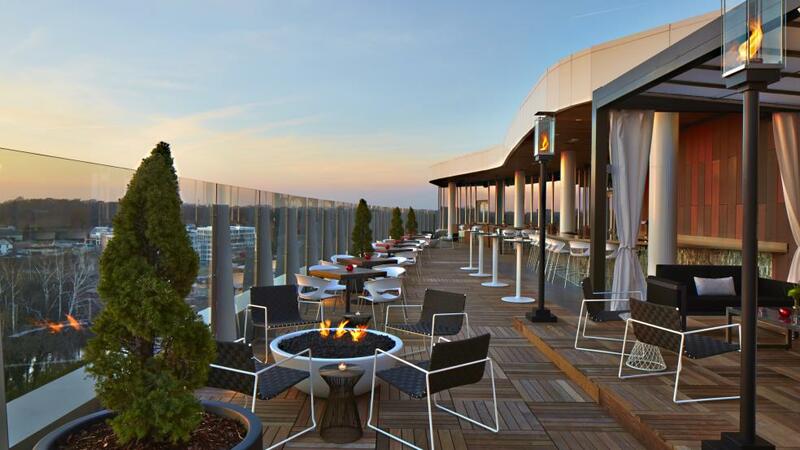 The Embassy Suites Dublin provides 12,800 square feet of flexible meeting and banquet space. The divisible Ballroom is 6,100 square feet and can accommodate up to 1,100 people. There are nine other meeting rooms that can accommodate 14 to 200 people. The atrium is an excellent space to use for exhibits and networking. Meeting Space: 12,800 sq. ft.
Columbus Marriott Northwest is a full service hotel currently undergoing room renovations and is scheduled for future common area renovations. 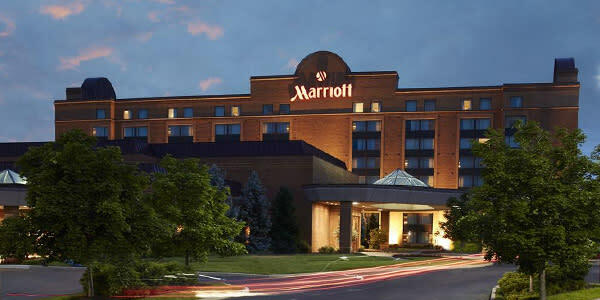 From small gatherings to grand events, the Marriott Columbus Northwest provides 12,585 square feet of flexible function space for your meetings. The Dublin Ballroom can accommodate over 700 attendees for receptions and easily divides into six sections. The well-appointed executive boardrooms provide an inviting, comfortable environment for all-day meetings or breakout rooms. Meeting Space: 12,500 sq. ft. The NEW AC Hotel by Marriott is a sleek, cosmopolitan-inspired hotel under development as part of the Bridge Park Project. The hotel will be eight stories with approximately 150 rooms and an adjacent conference center will be built as part of Dublin’s Bridge Park neighborhood. 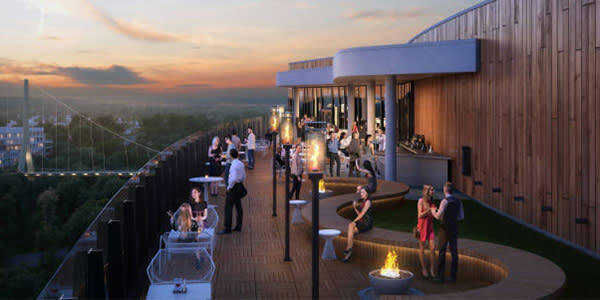 Guests can dine above lush tree line while enjoying Dublin’s cityscape views at VASO, the hotel’s rooftop restaurant and bar. Meeting Space: 1,360 sq. ft.